Always a sad task for me, I finally went through my stamp sets to pull up the ones that are retiring. I loved finding this set, though, and deciding it stays in the Keep pile! This is one of those really useful sets that will last. It has the ever needed Thank You's in cute, but not overly trendy, phrases and fonts. There are a variety of sizes, so it will work for many different layouts. Yup. A Keeper. The set of note cards I'm sharing today use the Park Lane Designer Series Paper, also retiring June 2nd. I have to admit. I'm going to stock up on this one (at this writing, it is still in stock! Fingers crossed my order gets there before they run out!). I love the patterns, both girly and masculine in the same set. The color scheme is good also, with a nice sampling of current colors. To make these note cards, I cut down 12x12 paper into 3"x 8" strips, folded to 3x4". This is economical, you can get 6 from a sheet. This size is necessary to use the Wood Mount Half Case Boxes (replacement cases, to store small wood mount stamp sets) as a box for my note cards. The box can hold a little larger, but then I added the economy of getting 4 envelopes out of a single 12x12" sheet, and well... It is nice to have such easy cuts! Using the Envelope Punch Board you can make ANY SIZE envelope out of your own paper. From 2x3.5" gift Card size, up to 6x8.5", it uses regular card stock, Designer Series Paper, and now - well, soon!! Coming June 2nd! - the new packs of Envelope Paper! I got these in the new In Color shades to test them. Very nice price point at $6 for 20 sheets! That's alot of pretty envelopes! The paper is a little lighter weight than the Designer Series Paper, but still really good pattern mix and it took to the punching and scoring perfectly. 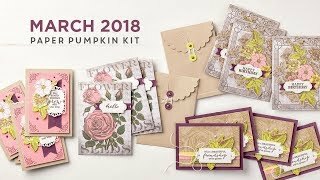 Definitely one to add to your Wish List, it comes in the 2015-16 In Color Pack, and Neutrals with Whisper White, Kraft, and Very Vanilla - perfect to embellish with your choice of stamps! Anyhow. Finished up the note cards with a simple card stock belly band. I think they're very clean, simple, and can be used for men and women. They are just the right size to tuck a gift card into, which can come in handy!! Back to the stacks to see what other fun sets I can keep!! 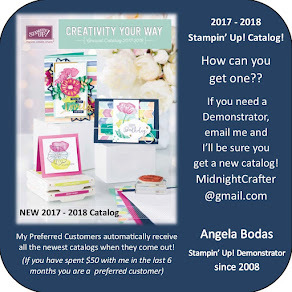 Envelope Punch Board - use card size 3 x 4; cut paper to 6 x 6"
Belly Band - 1 x 11" of card stock, score and trim once note cards are in envelopes so band is snug but not too tight. Use Sticky Strip adhesive to adhere ends to each other.